Abstract: People living with certain chronic diseases such as HIV experience considerable stigma and discrimination because of their illness. HIV-related stigma can have a negative effect not only on emotional well-being of people living with HIV, but also on their adherence to HIV treatment recommendations. This is unfortunate because current treatment regimens for HIV are very effective in reducing viral loads, making it possible for persons living with HIV to have long and productive lives. However, there is a scarcity of research that sheds light on how HIV-related stigma affects outcomes. 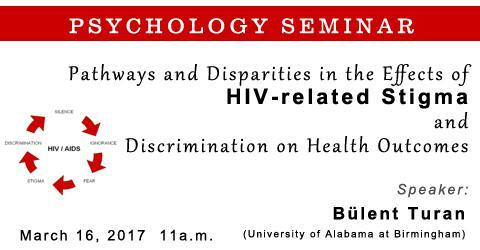 In this talk I will present our recent work on the specific mechanisms (including mechanisms in the areas of interpersonal relations, psychological resources, mental health, and stress) responsible for the effects of HIV-related stigma on health outcomes for people living with HIV.